> These are precision, Solar Radiometers that we have handmade in Germany. 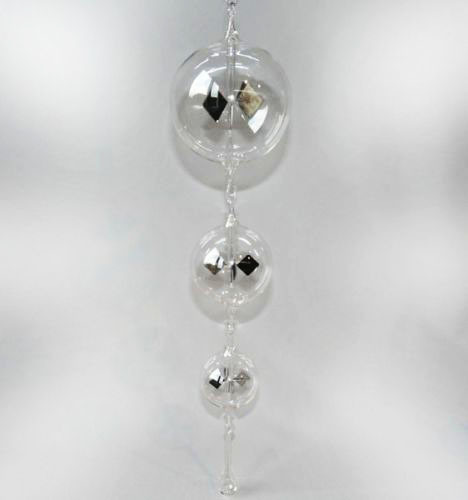 Unlike inexpensive toy Radiometers, these are highly sensitive and will respond to just the ambient heat & light in a room. 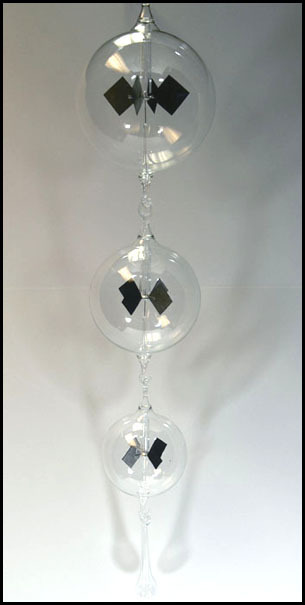 Each individual Radiometer is a different size and they can either be hooked together as shown, or hung separately. The Solar Radiometer (also known as a Light Mill) is an educational and demonstration device invented by physicist Sir William Crookes in 1873. Crookes thought it was the 'pressure' of the sunlight that made the Radiometer work. Actually, it was the infrared energy in sunlight that made the vanes turn. Any source of infrared (heat) energy will power the Radiometer. 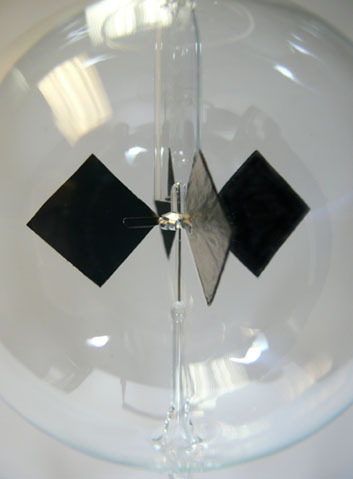 Inside the Radiometer there are four vanes, each has one blackened side and one silvered side. It is encased in a clear glass bulb at very low air pressure. The different colors on either side of the "vane blades" create the convection currents and that causes the blades to spin when exposed to light or heat. The more intense the light is that shines on it, the faster the vanes inside will turn. With bright light shining on it, the vanes will turn at speeds up to 3,000 RPM. The three Radiometer diameters measure approximately 3.5", 3.0" & 2.5". The overall length of the device if they are all hooked together is in the image is 18".